Cichlids are a blast to keep. They have very interesting personalities. 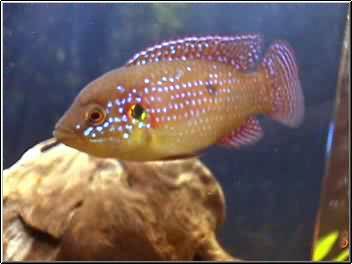 My red Jewel cichlid likes to eat a lot. I don't think it ever gets full. It really enjoys lots of meaty food. It's growth took off when I started feeding it frozen blood worms. It colored up very nicely on blood worms too. 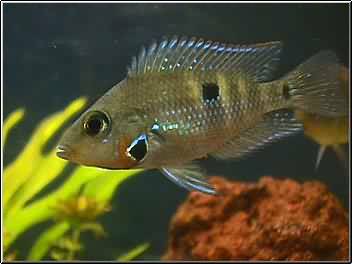 In addition to blood worms I feed it live earthworms, flake food, cichlid pellets, freeze dried shrimp, frozen broccoli and live zebra danios. 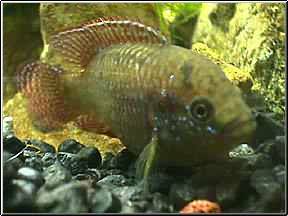 I feed the same foods to my fire mouth (cichlasoma meeki) and it also colored up nicely when I added frozen bloodworms to it's diet. My fire mouth is not as greedy of a eater as my jewel and it is not quite as aggressive. Currently my cichlids live in a 55 gallon tank. The tank has black gravel. It is decorated with lots of rocks (granite, petrified wook and red lava) and driftwood and some floating plants. My cichlids love the rock and driftwood caves. I got a great deal on two big bags of plastic plants at a thrift store and added them. I got a real bargain when I bought this tank. It came with the gravel, rocks, petrified wood, an Aquaclear 300 a Hot Magnum and a Whisper 3, the stand lots of food and medicine and several cichlids. The total cost to me was $130. For filtration the tank is now running two Aquaclear 300 power filters a Hot Magnum power filter with a biowheel and a Fluval 304 canister filter. 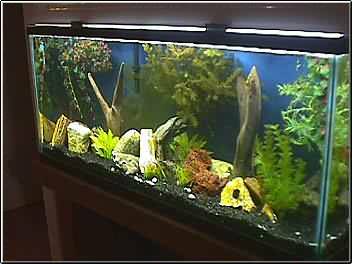 I will transfer one of the Aquaclear filters to my 20 gallon tank when I get it set up. I don't think that the Fluval was a good choice for this tank, the Aquaclears and the Magnum are much better mechanical filters for messy cichlids. I change at least 30 percent of the water weekly and some times I change 10 percent of the water everyday depending on my mood.